I asked for your questions about all things publishing last week and you delivered, LitReactors! This week I'm answering two of the most frequently asked questions I received as an agent and continue to receive as a consultant. As always, I give you my best counsel, straight up. I have a series of three completed manuscripts. Is it better to try and advertise one or all three to an agent and/or publisher, and is it okay to advertise them out of synchronous order? I would like to submit my paranormal thriller novel, TITLE, complete at 150,000 words for your review. TITLE is the first in a three book series. Book two in the series, TITLE, is nearly completed and the final book in the series is in outline form. In this paragraph you would write a brief synopsis of the book also summing up the general hook of the series. In this paragraph you give the agent some important background info about yourself. List a few writing credits here or something interesting about your life. End the letter with a quick, “Thank you for your consideration. I look forward to hearing from you. If you have a series of novels and you feel the need to pitch one of them out of sequential order, this sends up red flags to me, signaling that your series isn’t strongly developed. If this is the case, I would encourage you to reexamine the arc of the entire series and then the arcs of your protags and antags to ensure the series is ready to submit. Like your readers, we want to be introduced to your main character and their world from the beginning. If you’re using the word “series” loosely as in a collection of unrelated novels, then pitch your strongest novel to agents or publishers you’ve researched as a good fit for you and your work, regardless of when you wrote them. Just keep in mind, agents and publishers prefer to acquire a “brand” of writer, meaning a writer that stays within the parameters of their genre and has the desire and drive to keep producing within the genre (there may be room to cross genres once you’re more established). Good luck, Leif! Let us know when you've landed your agent or publishing deal. Is it possible to get an agent or a book publishing deal based only on a few short stories and a strong treatment/pitch for a book? Or do you suggest going ahead and writing the book then trying to sell it/find an agent? Also, I assume it would help to have the short stories published but I feel like there is not a lucrative market for them unless you are an established author (see example: Chuck Palahniuk), so I am very hesitant to "give" away my hard work just for exposure (free/online) or very little money (lit mag). It’s very unlikely to score agency representation or a publishing deal on a few unpublished short stories. It’s even more unlikely to hook an agent or a publisher on a novel treatment if you’re not an established author. And there’s no such thing as a “strong rough draft” – if you feel your book is still rough, it’s not finished. Forget about agents and publishers for a few seconds. Your goal is to BECOME an established writer and the only way you’re going to do that is to get your work in print. While I don't condone giving your work to publications who don't honor a writer's time and talent, offering them nothing in return for their words, there are some publications or sites that might be worth the exposure because of the size of their circulation. You just might have to give some of your work away or sell it for pennies in return for the exposure, which is pretty much the process when you’re just starting out. Does this take time? Oh yeah. Should you keep your day job? Absolutely. So here’s what I’d like you to do, Dan - write your novel. Writers, THERE ARE NO SHORT CUTS to earning your place on the shelf. Your best resources for learning how to publish are the biographies of your favorite authors. If you’ve got short stories polished and ready to sell, submit them to every appropriate market for your work (following the guidelines stipulated in the journals/mags/sites/etc.). Keep that submission process rolling – produce, polish, pitch, submit, repeat. Your goal is to get as much of your work placed in as many publications as possible – this becomes your writing portfolio. Is it hard work? Hell, yes! How much do you love writing? What’s it worth to you? Gut check time, my friend. Another option for you to build your portfolio is to freelance articles to online and print media. When you’ve had a nice handful of your pieces placed, when your novel has been written and edited to perfection (note I didn’t say “rough draft”), THEN start querying and submitting your work to literary agents and/or publishers. Even if you decide to self-publish, you should still follow this path – you will become a stronger writer for it. And that’s what your readers want. Now, is it possible to secure agency representation or a book deal with no prior publishing credits? It is. But the more people who know about you and your work, the better. The more opportunity you create to hone your craft, the better. Good luck, Dan! Keep us posted on your progress. Thank you, writers, for your questions this week. Now go do something worth writing about. If you have a question related to writing, literary agents, publishing, platform or promotion, I'm now taking questions for Issue 2. I'll choose a few to answer in my next column. Remember, the more specific you are, the better I can direct you. Issue 2 answers will be posted Monday, October 24th. 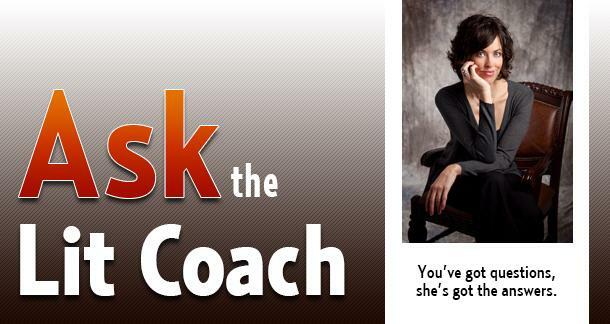 Click here to submit a question for Issue 2 of Q&A with the lit coach! Thank you so much Erin. Your advice is priceless. Thank you for the tips. I've pretty much been doing as you suggested in the first paragraph, but I was just curious about other possibilities. Thank you. Dan and Leif, thank you. I'm glad the direction provided some clarity. Keep us posted on your successes. Great stuff, Erin. Exactly the advice that I would have given. Look forward to your columns, I'll be reading them too, maybe you can straighten me out too. :-) It's tough out here in the trenches, great to have such an experienced and talented voice like yourself here at LR.